Don't let leftovers go to waste! 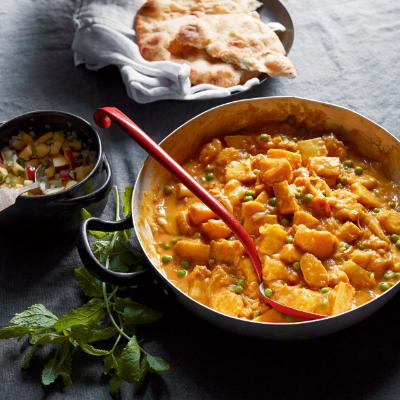 This curry makes clever use of storecupboard ingredients and those cooked vegetables that might otherwise get thrown away. 1 Heat the oil in a large pan and add the onion, garlic and ginger. Cook gently for 5 minutes until soft and golden. Add the cayenne, turmeric and garam masala, cook for a minute then add the potatoes and parsnips and toss to coat in the spices. Stir in the tomatoes and some seasoning and simmer for a couple of minutes. 2 Stir in the coconut milk and peas then bring to the boil. Simmer gently for 5 minutes until the sauce is thickened. Add the lemon juice and check the seasoning. 3 Make the chutney by mixing together the apple, onion and mint. Serve the curry with the chutney alongside, and naan bread or rice, if you wish. To use raw potatoes and parsnips,simply peel 500g of each and toss with spices then cook in the tomato sauce until just tender.